It's an all too familiar story: driver doesn't spot cyclist. Driver turns. Driver hits cyclist. But what if cyclist had all the tools to protect them from danger? With the latest in bicycle gadgetry, they can. Making your presence known on your two-wheeled adventure is key to survival and the Blaze bike light by British designer Emily Brooke does exactly that. 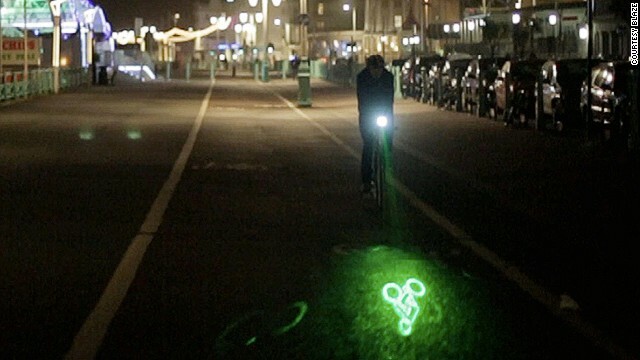 A front-mounted light powered by bright LEDs, Blaze projects a green laser image of a bicycle onto the road ahead to let motorists know you are coming. Brooke, herself a keen cyclist, said she wanted to come up with a solution to the principal cause of cyclist fatalities -- being struck by a turning vehicle. 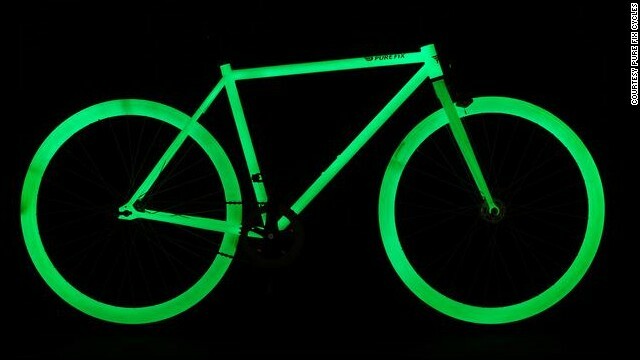 With Pure Fix's glow-in-the-dark bike, nighttime riding just became less risky. The entire frame is charged by sunlight and will illuminate at night. 'Transform any bike into a smart bike' is the Helios tagline, whose detachable smart bars house LED lights that provide widespread illumination. You can use your smartphone to alter the color and intensity of your lights as well as track your bike's coordinates should it get stolen. 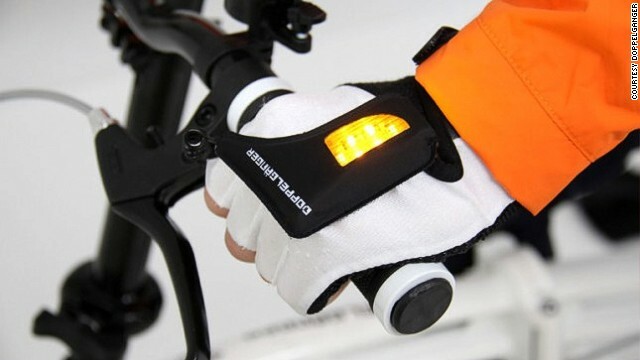 Japanese bicycle company Doppelganger has introduced these light-up gloves to improve visibility when indicating. This one's for cars rather than bikes but it's still a great tool for safety on the roads. 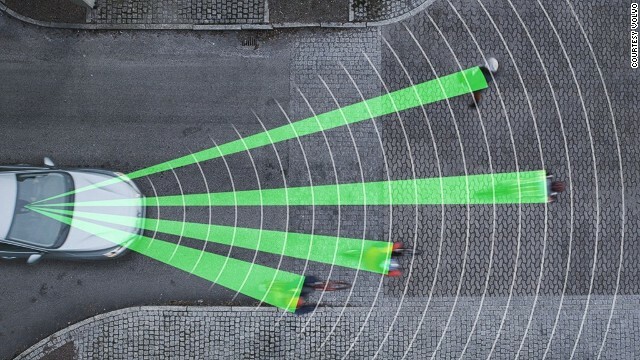 Volvo recently won a 'Techies' award for their Cyclist Detection System, which alerts drivers to nearby cyclists and automatically applies the brakes if they get too close. 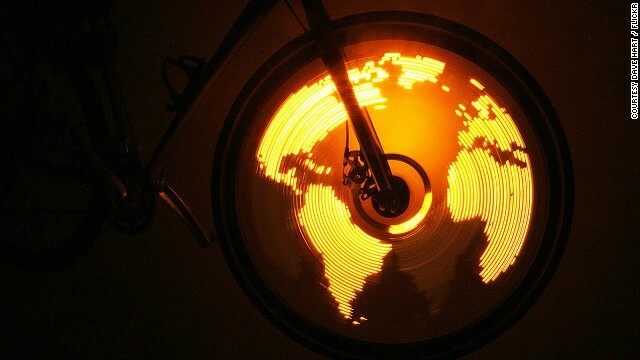 Spoke POV's 'design your own' wheel lights inject a little fun and creativity into cyclist safety. With their 'easy-to-make' electronic kit, cyclists can program their wheels to display whatever they wish. 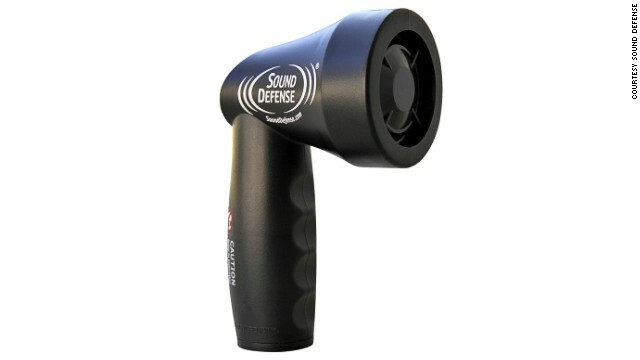 It may look like a hairdryer but in fact the Sound Defense K9 is oh so much more: it can keep you safe from pursuing dogs. By emitting a high frequency audio signal that focuses in on sensitive canine ears, the device will keep excitable dogs at bay (but don't worry, it causes no harm whatsoever). The aim of Cycle Alert is to promote mutual respect on the roads. It comprises of three units: a sensor fitted to a bicycle, a sensor fitted to a vehicle and a dashboard receiver. The three components communicate, notifying a driver when a cyclist is in close proximity. Is it a seat? Is it a pump? Well, actually, it's both. 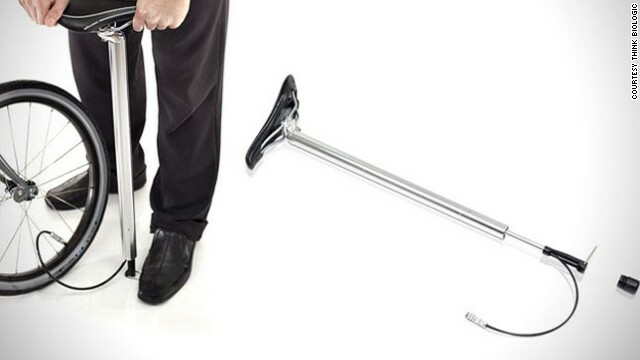 This nifty bicycle seat from Think Biologic detaches easily to double up as a pump, so you never get caught on the road with a flat tyre again. With Retrofitz's DIY cycle shoes kit you no longer need to look the part to be the part. 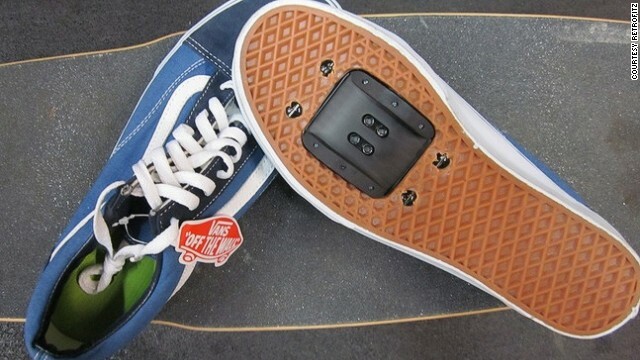 Now (according to Retrofitz) you can easily insert a plate into your everyday sneakers to keep your feet in place while you zip around the city. 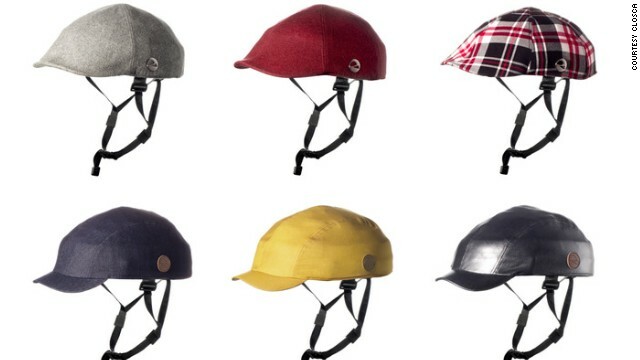 Carrera's new foldable helmet is a 'revolution in city bike protection'. It's flexible frame means you can stash it away in a bag with no compromise on safety. Jockey caps, what jockey caps? 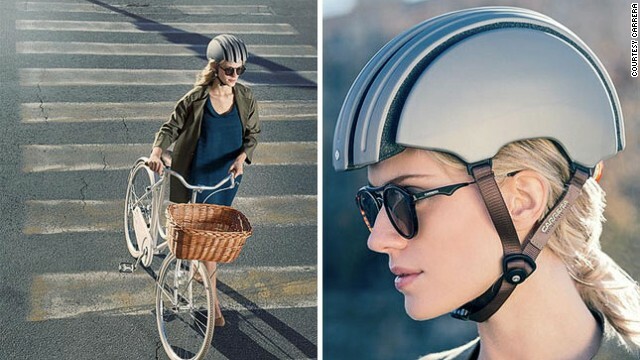 A similar concept but this time by Closca, these foldable cycle helmets come in an array of different fabrics so you can keep it chic in the cycle lane. 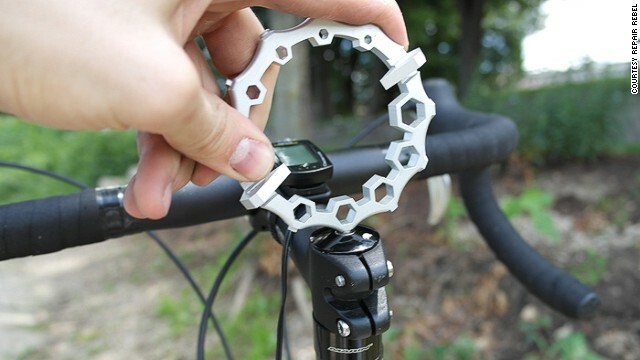 Repair Rebel is an all-in-one bike multitool that attaches to your bike so you'll never be caught off guard with bicycle dysfunction. It recently smashed its pledge of $10,000 on crowdfunding site Kickstarter by almost 250%. (CNN) -- It looks like a regular bike light, but one day a Blaze could save your life. Invented by a UK design student, Blaze is a detachable lamp that projects a laser image five meters in front of your bicycle to let motorists, bus drivers and pedestrians know you are coming. 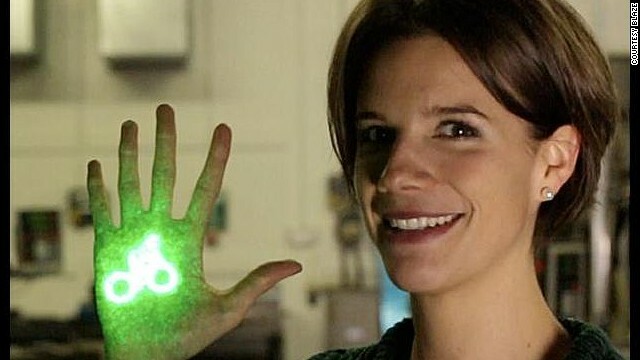 Blaze's inventor, Emily Brooke, a physics student turned product designer, came up with the idea while she was studying at Brighton university. "While studying I knew the problem that I wanted to tackle very clearly: sideswiping or blind spot incidents where vehicles turn across a cyclist's path." Incidences of cycling fatalities remain a problem in most major capitals around the world. As more and more commuters travel to work on two wheels rather than four, a myriad of new safety equipment, infrastructure and road rules are being introduced to keep cyclists out of harm's way. In many cities in the U.S. and beyond, cycling is on the rise. According to statistics published by Governing Data, cycling has grown exponentially in most major U.S. cities since 2006. In London cycling has more than doubled in the last decade and in many cities in the Netherlands, Germany and Denmark, cycling now accounts for more than 20% of urban trips. In spite of a gradual decline, urban cycling also remains hugely popular across China. "Last year over 3,000 people were killed or seriously injured on Britain's roads alone. We have over half a million people cycle in London every day and the fatality statistics are really terrifying. Over a hundred people were killed last year. The fact that I really wanted to focus on was the 79% of cyclists hit were travelling straight ahead and a vehicle turned into them so that was the one cyclist that I really focused on in designing Blaze," Brooke says. Blaze is a front-mounted light powered by bright LEDs that also projects a green laser image of a bicycle onto the road to let motorists know a cyclist is coming. The aim is to help prevent vehicles from turning across a cyclist's path of cyclists by increasing their 'footprint' on the road. It is one of a new crop of tech products aimed at improving cyclist safety. The annual Interbike conference, which opens next week, will showcase a large number of new products including a device that emits high frequency audio signals to keep pursuing dogs at bay. Also being launched soon is a set of 'smart handle bars' fitted with LED lights that adjust to your environment and speed. They will also track your bike via SMS if it is stolen. 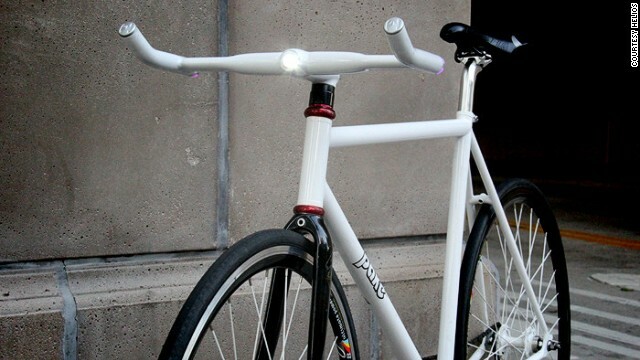 Pure Fix Cycles have a glow-in-the-dark bike frame to light up your entire bicycle at night. Dr Graham Hole, a Senior Lecturer in Psychology at the University of Sussex, says that increasing visibility could be critical to keeping cyclists safe: "Brooke's invention could be a major aid to detecting cyclists. It gives the driver advance warning of a cyclist's approach ... it has the potential to make a significant difference to cyclists' safety on the roads." Carlton Reid, editor of BikeBiz agrees that products that aim to increase cyclist visibility could be useful in preventing accidents: "Anything that increases conspicuity has got to be a good thing, although in the UK cyclists and motorcyclists have a saying about those motorists who knock into us. We call such collisions: SMIDSYs -- 'sorry mate I didn't see you.'" Many cyclists believe that rather than developing new technology, safe cycling requires changes in the attitudes and behaviors of road users. Andy Clarke, President of the League of American Bicyclists says: "Clearly, better bike infrastructure encourages more riders, makes things safer for both cyclists and motorists, and encourages better behavior by riders -- all of which are good things. "But perhaps more fundamental than any road design or technological fix attached to cars or bikes is an improvement in operator behavior! Getting drivers to pay attention and be a little more patient (with everybody, not just cyclists) would make the world of difference out there. Distracted, drunk, drugged, drowsy and just plain poor driving is a real scourge -- especially if you are on foot or on a bike."